There are many tools available to make GIF. For ex: Photoshop or any online tools. But making GIF with those tool is really hard, and it need lot time to make. Moreover, you can make GIF by adding multiple images and not by capturing on-screen activity. Some users just need to capture some area and want to make GIF out of it. For example: If you need to make a GIF by capturing YouTube video or any other video, then Photoshop won’t be helpful. That’s where GIFCam comes handy. GIFCam is a small, portable and standalone application, which is designed to record onscreen activity and make GIF. This is something like camera for capturing your desktop. All you need to do is- just launch the app and resize the frame to cover capturing location and hit Rec button. Once you hit record button it will start recording the area inside that frame. You can move the frame anywhere you want to start capturing that location. Once you complete capturing that area, hit Stop button (Rec button will changed to Stop button) to stop recording. To save recorded area with GIF, just hit Save button, and it will save it in GIF. If you wish to preview recorded area before saving, then click on small down arrow icon on Save button there you’ll see Preview option, click on it to preview it. 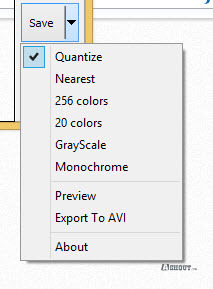 You can save GIF in 6 color reduction formats like Quantize, Nearest, 256 colors, 20 colors, GrayScale and Monochrome. To use this different color option, just record the screen first and then try to experiment by changing different color option and hit Preview to see the result. If you like the result then Hit Save button to save the result in GIF. There is also an option to edit Frames that you have recorded using GIFCam. To edit, click on Edit button, and you’ll see all the frames. To see all other frames drag the scroll bar to the right side which appears below the window. Right click on any frame and you will see lot other options. You add Text to any frame you want. To add text to frame, just go to the frame that you want to add text and choose Add Text option to add text on that frame. 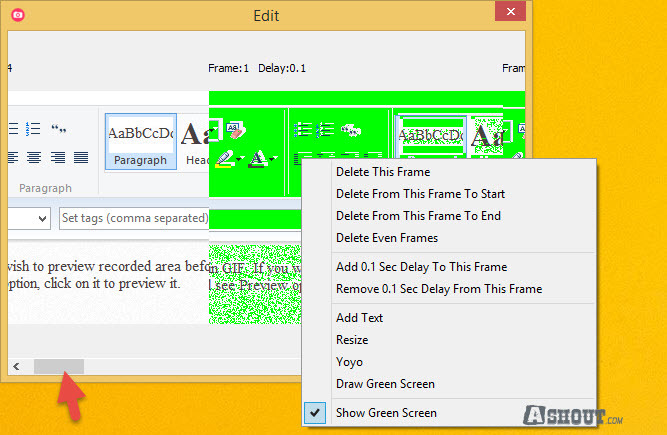 If you wish to delete any frame, then you can do that by going to that frame and choose Delete This frame option. There are few other options you can find on this tool. For example, you can add delay to frame, remove delay from frame, draw at once on all other frames by using Draw Green Screen option. 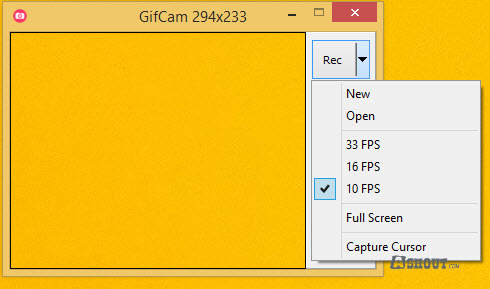 Here you can set different FPS (Frames Per Second) for your recordings. Also, if you wish to record Full screen window, then choose Full Screen option here. By default, this tool won’t capture your Cursor while recording, if you wish to record the cursor as well, then choose Capture Cursor option here. 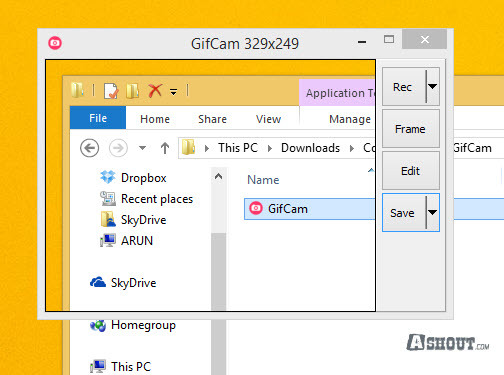 GifCam is really a handy tool to capture any activity on your screen or record any video and make GIF out it. This is really simple to use, and everyone can easily understand how to use this tool. If you are looking for some to tool to capture and make GIF easily without much settings, then you should try this.